At Master Mechanic, as proud Canadians, we love our winters. As car enthusiasts, though, there’s also a lot about it we dislike. That’s because winter months are incredibly tough on our cars, inside and out. Although we’ve built our reputation on repairing the mechanical components of vehicles, that doesn’t mean we don’t appreciate a clean car as much as the next driver! 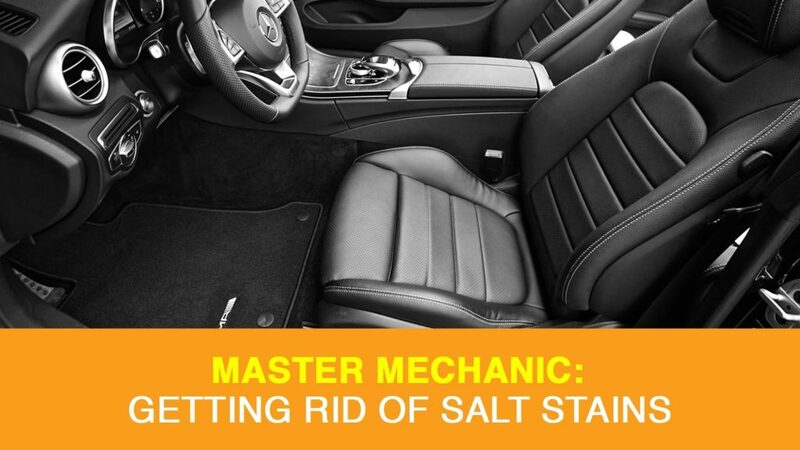 Over the winter, salt and dirt gets tracked into our cars and often leaves an ugly residue on our car mats. Thankfully, there’s an easy way to clean salt stains and ice melt from your car to get it looking pristine once again. You’ll only need a few household items to get your car mats looking like new. In your spray bottle, combine 1 cup of white vinegar with 1 cup of warm water. Give it a quick shake to make sure the solution is mixed thoroughly. Take one of your car mats and test an inconspicuous area by spraying a small amount of the solution. You’ll want to make sure it doesn’t stain or damage your mat in any way before applying all over. Once the solution has dried completely, and you’re sure it’s safe, you’re ready to clean your car. Remove all the remaining mats from your car and spray each of them with the mixture. Use a scrub brush to remove the tough stains and caked-on dirt. Apply more cleaning solution as you scrub, if needed. Note: for tough stains, you might need to let your solution soak a bit. Use a clean towel to blot the mats and absorb all the excess moisture. As your mats dry, you should start to see if any salt stains remain. If they do, repeat step 3 + 4 until they’re entirely stain-free. Once no more stains remain, let your mats air dry before you put them back in your car. If you cleaned your car’s interior carpet, make sure to leave your windows open until they’re dry as well. Putting wet mats in your vehicle can cause unwanted odours and bacteria to form, which is probably the last thing you want if you’re cleaning your car. That’s it! If you follow the steps above, you should be able to get your mats looking like new for Spring. Remember to give your car’s exterior a thorough wash and wax when the temperature heats up to protect your paint as well. While your car may look good, it’s important to make sure it’s running correctly after a harsh Winter. If you have any questions about your car, are due for routine maintenance, or think something isn’t running right, don’t hesitate to contact your local Master Mechanic!